I love to make an assortment of Italian pastries for Easter. Every year I make mom's Easter Cassata in her memory. This year I made it just a little different. This custard ricotta filling is perfect in these little cupcake tins for individual servings and so cute! It's just a little more festive looking. 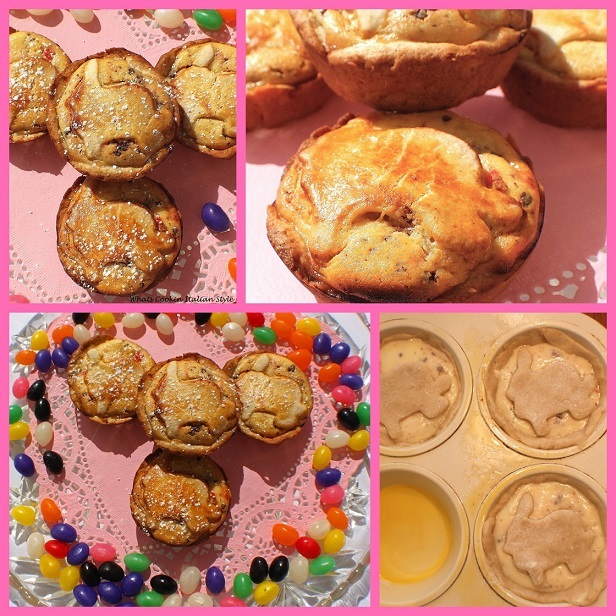 I added a little bunny on baked into my Easter Mini Cassata Cheesecakes. The children loved them. 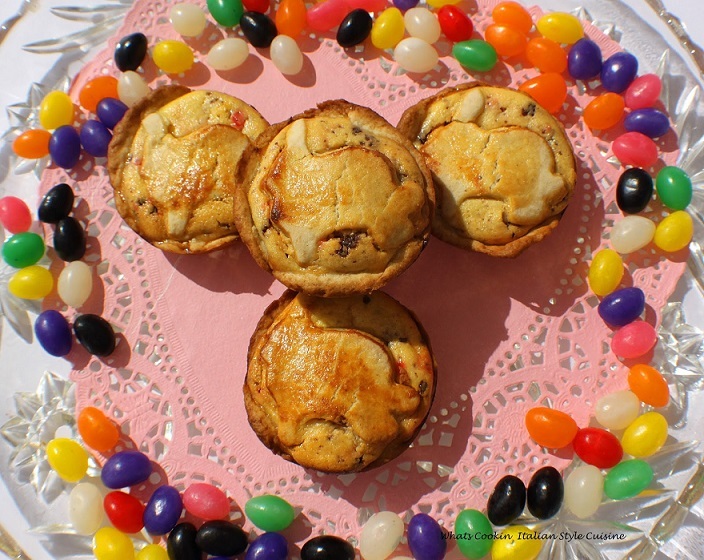 They make such a pretty addition to the dessert platter of baked treats for our Easter tray. Cassata is a light cheesecake made with ricotta cheese, fruits, and chocolate baked in a crust like a custard-like filling. Mom always made one loaded with more chocolate than fruit just for me. I loved the chocolate as a child. Now as an adult I love the cherry more, go figure. The traditional addition to cassata is adding citron. I was never a fan of it. Mom would use the maraschino cherries. Everyone makes it just a little different. I have even put fresh chopped bing cherries in it instead of the maraschino cherries. If you want an authentic Italian cassata you have to add the citron. I love to get unique ideas and have a festive tray of desserts every year. That's why this year I decided to make mini cassata with little bunnies on top. I just loved how these came out. It was actually easier to make these than cut all the strips I make for a lattice top for the regular cassata. If you don't have a bunny cookie cutter, you can use a flower, chicken, anything else that may remind you of Spring, Easter and the Holiday or just cut an oval shape for an Easter egg. There are so many adorable cookie cutters out there, just find one that fit the top a little smaller than your cupcake tin. These little bunnies really baked into the cheesecake perfectly. The bunny rose a little, the spread out to fill the top perfectly. It's so much more fun to bake creative foods to eat. When I come up with something a little different that looks cute it makes me happy. The cheese filling is a custard baked into a delicious cookie crust that everyone loves. The table is always set with old fashioned soft Italian cookies and a loaded tray of pastries of all kinds. For the kids, there is always an Easter cake that is all decorated with marshmallow peeps. Last year I put marshmallow peeps on top of cupcakes with little jelly beans for the eggs and tinted coconut. It makes me even happier when I see the kids face light up with those big smiles. As they grow up, it will give them some great memories to look back on. I really loved having my kids help me in the kitchen when they were growing up. Now they both love to cook and come up with some great ideas. I just love the look on their faces when they see their baskets. Easter is so much fun with the kids, and we have another blessing on the way! Isabella will be born in September! We still enjoy cooking together every chance we get. Now I have grandchildren to look forward to making some more memories with to pass on traditions. Every year gets better with the memories we make and it is the foundation we build together for our future kids to carry on what we all started. I carried on my mom's traditions she instilled in all of us and now it's my turn to do the same and so far, I am thrilled my family continues with the same vision. Check out our cute little Easter baskets we make from ice cream sugar cones! 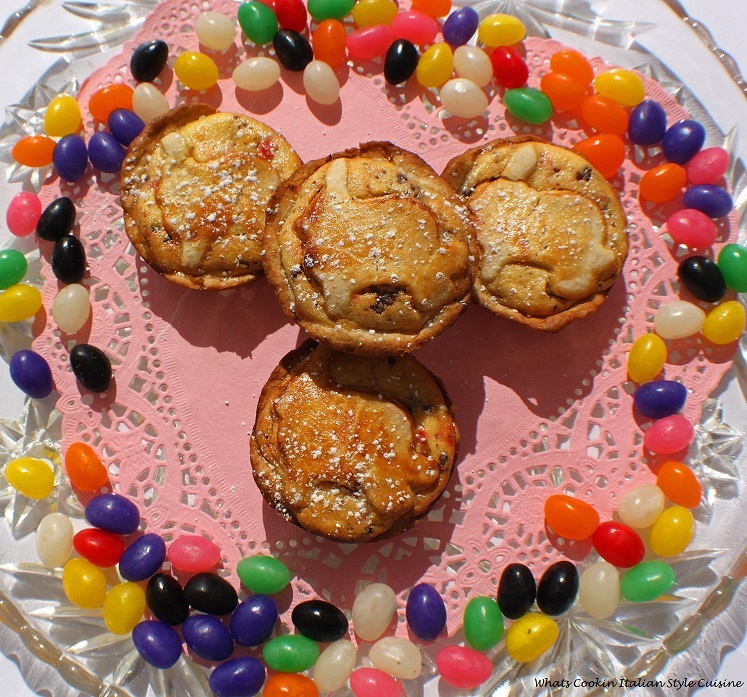 These are miniature Easter cassata cups made in cupcakes tins for individual servings. It's a traditional Easter cassata Italian recipe made with ricotta and is a cheesecake base and cookie crust. Place eggs in a bowl with the sugar and beat for 3 minutes. Fold in the cherries, chocolate, and vanilla set aside. Cut out as many cookie cutter tops that you need and set them aside. I made around 16 - cupcake mini cassata cheesecakes. Oil spray cupcake tins. 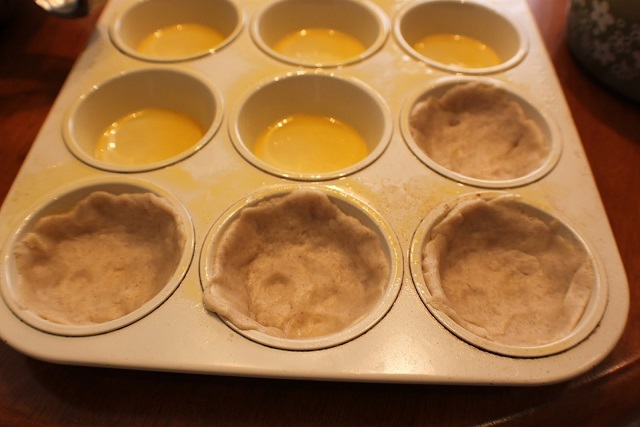 Roll out dough to fit tins to fit for the bottom of each cupcake tin. Brush with beaten egg wash for a shiny top. Bake at 350 for 25 to 35 minutes until golden brown on top. If you have additional batter left over and dough makes a small cassata in a pie plate. I usually have filling leftover. Wish I could try one! They look so inviting and festive. 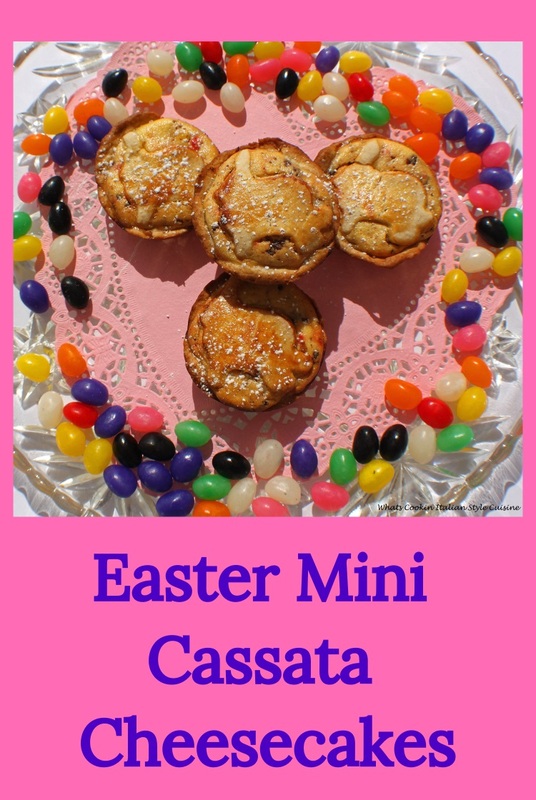 Wow, these EASTER MINI CASSATA CHEESECAKES are so cute! I would love to eat them for breakfast, lunch and dinner! Thank you for sharing this great recipe! These look really cute and easy to make. The perfect little easter treat. How cute little idea this is. I have to try it before easter. These cheesecakes look adorable and so delicious! Perfect for Easter and also for upcoming Shavuot. I love foods that you make every (fill in the holiday here). For us, it was my Grandmother's "lamb" cake every easter (a cake she made in a lamb shaped mold). These Cassata cheesecakes sound delish -- and I would like them with or without citron. What a cute idea to put the bunnies on top, they look delicious!! I have NEVER heard of these before. I love finding all the "traditional" recipes for holidays. So fun to see what others eat to celebrate with. Claudia, these Mini Cheescakes are the most clever and the cutest idea, especially with the little cutout bunnies on the top that the kids would love to help with! Love the creativity and the recipe! They are not only adorable, they sound delicious! We love cheesecake and these adorable creations look amazing! Love heirloom recipes too! These bunny cheesecakes are adorable and so perfect for Easter! I agree that creatively decorated food is more fun to eat! So smart to do this the easy way with a bunny shaped cookie cutter! How fun! I have never heard of cassata before. I love the bunny topper too. Very cute!! What a fun recipe. Children would be all over this. OOOH! Chocolate and cherries in cheesecake?! Yes, please! !